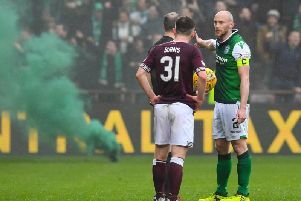 Hearts narrowed the gap on city rivals Hibs to two points after a comfortable win at Tynecastle with goals from Saulius Mikoliunas, Lee Miller, and an own goal from James Fowler. Steven Naismith had netted his first goal for Killie to earn a Scottish Cup replay with Hearts the week before and the 18-year-old was keen to see his name on the scoresheet again. He met a Stephen Murray flick 30 yards out but his long-range drive fell just wide of the post. That spurred Hearts into action and they had the best of the chances after that. Mikoliunas tried to square into the path of the on-rushing Dennis Wyness, but Killie goalkeeper Alan Combe managed to intercept the move before he could connect. However, Hearts did not have to wait too much longer for the opener when Mikoliunas grabbed his first goal for the club in the 15th minute. Gary Locke fouled Paul Hartley and Stephen Simmons took the resultant free-kick quickly, setting up Mikoliunas, who rounded the goalkeeper before slotting home from close range. Hearts extended their lead in the 25th minute, when Robbie Neilson punted into the box and Fowler knocked the ball into his own net under pressure from Jamie McAllister and Simmons. Kilmarnock manager Jim Jefferies was forced to make his first change of the game after just 28 minutes when Liam Fontaine left the field with a suspected broken nose and was replaced by Freddie Dindeleux. Killie were given little respite as half-time approached and only the woodwork prevented them falling further behind when a thunderous Wyness shot cracked off the crossbar. Hearts were threatening again after the break and it was only the heroics of Combe which prevented them extending their lead. The Killie keeper pulled off an impressive block to deny Mikoliunas a second goal and the ball fell to Wyness who looked certain to find the back of the net with a header on the six-yard line, but Combe somehow managed to parry that effort too. However, Hearts extended their lead again in the 61st minute. A stunning opportunist drive from Miller smacked off the underside of the crossbar before crossin the line and Combe had no chance of stopping the shot. Mikoliunas had been looking dangerous for Hearts all day and had another great opportunity to punish Kilmarnock but fired across the face of goal and wide. But the miss meant little as the Jambos earned a psychological boost ahead of the cup replay the week after. Hearts would go on to win 3-1 at Rugby Park with goals from Lee Wallace, Miller, and Deividas Cesnauskis. Hearts: Gordon, Neilson, Pressley, Berra, Wallace, Mikoliunas, Hartley, Simmons (Kizys, 74), McAllister, Miller (Thorarinsson, 80), Wyness (Burchill, 69). Subs not used:T Moilanen, C Sives, N MacFarlane, J Hamill. Kilmarnock: Combe, Fowler (Wales, 57), Lilley, Fontaine (Dindeleux, 28), Leven, Johnston, McDonald, Locke, Murray (Hay, 53), Boyd, Naismith. Subs not used: Bell, Invincibile, Ford, Dodds.